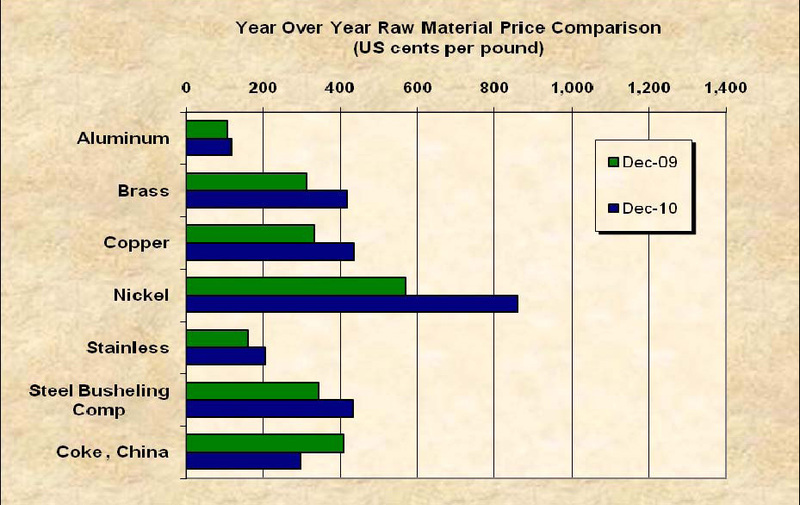 Aluminum is up 9.16% December 2009 – December 2010. Average price was up 33% over the year. Brass scrap up 34.29% since December 2009. Average for year up~43%. Copper 30.92% increase December 2009 –December 2010. Average for year up ~42%. Nickel up 51.86% since December 2009. Average for year up 62%. China Coke down 27.45%, The only item we track lower for the period. Raw material prices remain highly volatile, and are likely to remain so given global demand and supplier reticence to build inventory. This entry was posted on Thursday, January 13th, 2011 at 12:14 pm and is filed under Front Office. You can follow any responses to this entry through the RSS 2.0 feed. You can leave a response, or trackback from your own site.